You are at:Home»Posts Tagged "opossums"
I received an email from a dear friend with The “Fable of the Porcupine” and some adorable pictures of a baby porcupine. Not knowing very much about porcupines I searched the internet to learn more. I was very curious if they also could be a pet. Much to my amazement there was a vast array of information on porcupines. Of course National Geographic has a wonderful informative description of the porcupine. We all know that they are a prickly rodent, but did you know the Latin name means “quill pig”? 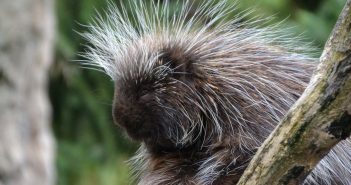 There are about two dozen species that all have a coat of needle-like quills. Considering there are only two species of beaver, twenty-four porcupine species surprised me.